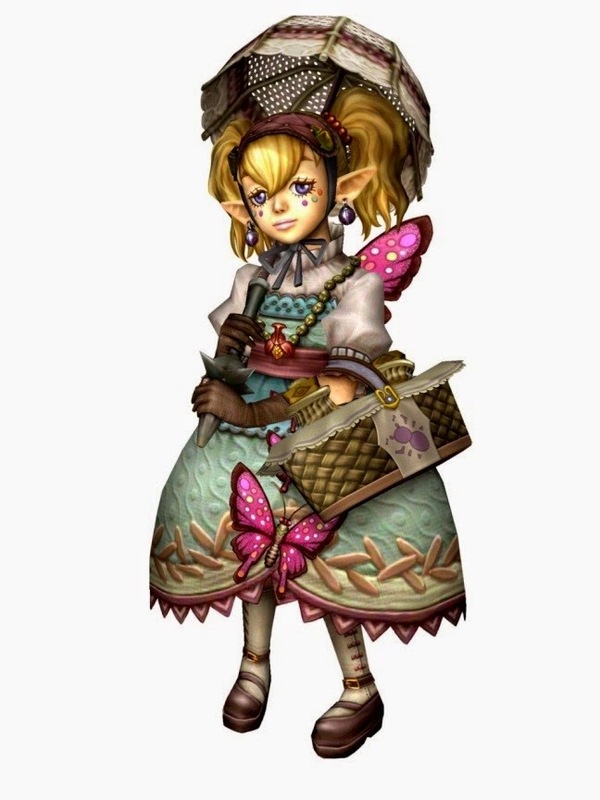 My character, Princess Agitha, was first featured in Twilight Princess but has since appeared in Hyrule Warriors. My design is based off of the Twilight Princess character, though there are only a few small differences in the design in the different games. So how did I make it? It’s actually a lot simpler than most people think. The hardest part is remembering that you are wearing duct tape, not fabric, so it doesn't stretch the same way. You have to include more zippers, snaps, and elastic than you would on fabric. 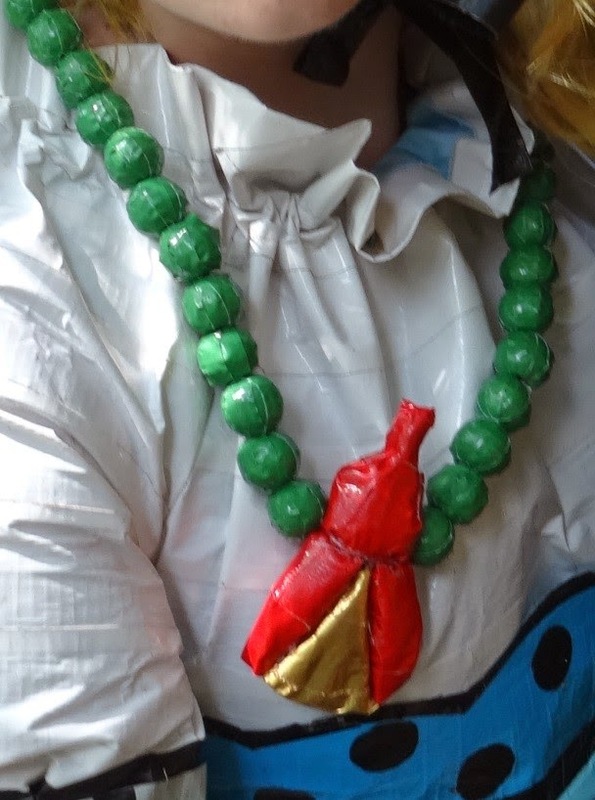 The shirt was one of the easier parts of the cosplay. I drafted a pattern similar to one I’d seen for a pirate shirt. This was ideal for a duct tape shirt because it wasn't a tight fitting shirt and it had a draw string around the neck making it easy to get on and off. 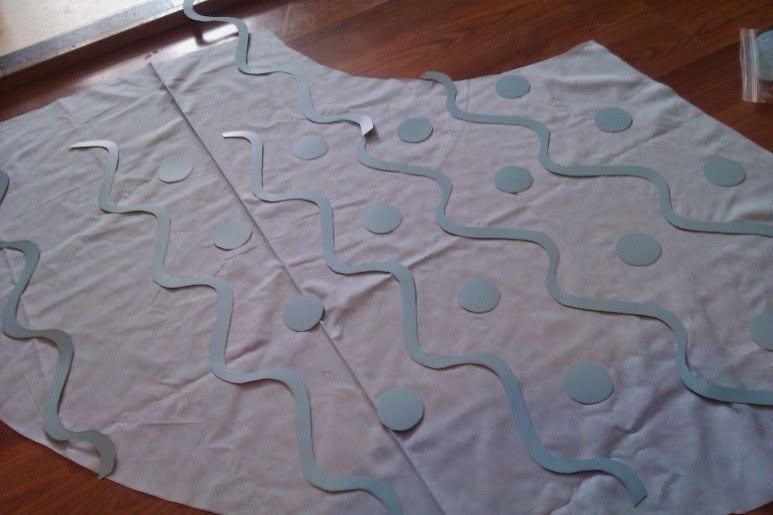 After drafting the pattern I cut it out of white cotton (I always try to match the color of the fabric to the duct tape). I like using cotton because it is light weight, cheap and comes in most colors. 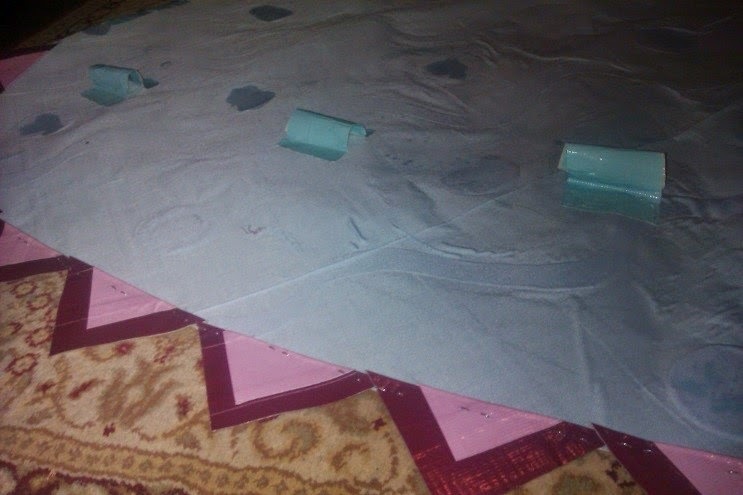 After cutting out all the pieces from cotton I covered the side of the fabric that was going to be facing out in duct tape. I never tape the inside as it is more comfortable to have cotton rubbing against you than duct tape. It also makes for a thinner outfit making it less hot, and easier to sew/work with. Since the sleeves had a pattern on them close to the cuff I taped that one before sewing the sides up. I simplified that pattern a bit from the original design, but when the elastic was added and the fabric was all scrunched up you couldn't tell anyways. After that I just sewed it together like I would any other fabric, and yes, I used my sewing machine and it handled it quit well. I did go through several needles throughout this project though. One way to avoid the needles breaking so often is by cleaning them after you sew a couple seams so sticky residue from the duct tape doesn't build up! Also be sure to use a more durable needle and thread. 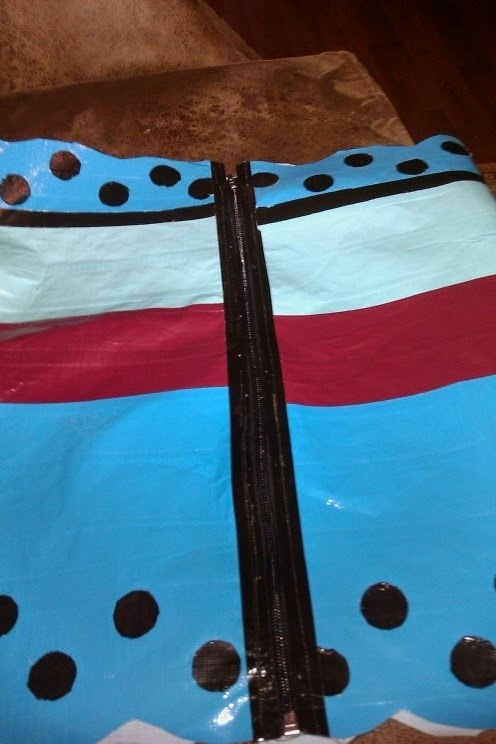 Since the fabric is duct taped the edges don’t fray so I didn't have to do any special seam finish. 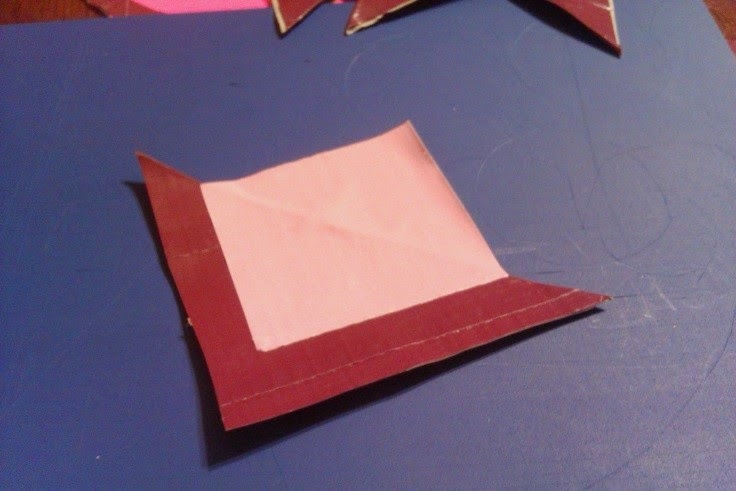 Occasionally I will staple the seams together after I've sewn them to add a little extra reinforcement. After getting the pieces sewn together I created a casing for a drawstring to go in the neck and for elastic on the arms. I just got a piece of fabric and sewed it on the top and bottom and put the elastic/drawstring through it. To hem the sleeves and neck I simply folded a piece of duct tape over the edge to give it a nice finish. Since the bottom of the shirt was in the corset and wouldn't be seen I left it un-hemmed to create less bulk. Duct tape is very bulky, so when you can go without the extra duct tape, do it. The skirt was probably my favorite piece to make – it was easy and fun. 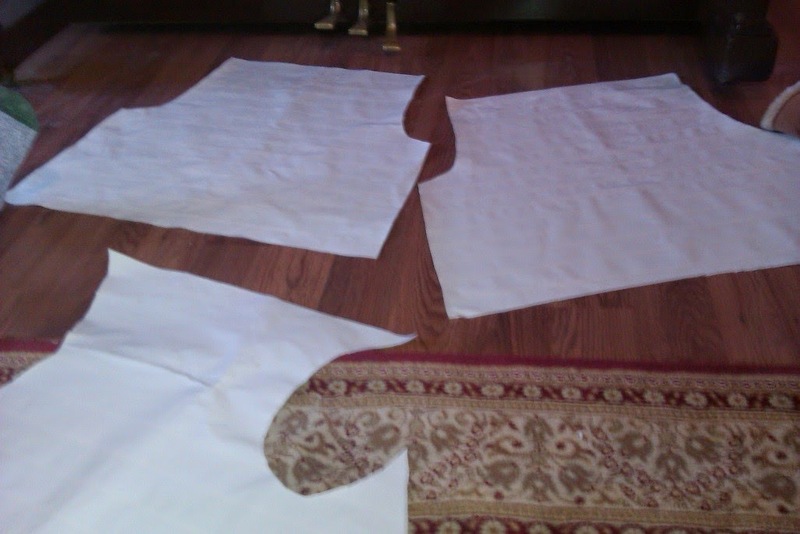 I started by drafting a pattern for a two piece skirt. I started with a pattern for a simple bubble skirt and basically split the pattern in half and added a little extra on the edges so the pieces would overlap. If you look at the design on the characters skirt you’ll notice that it has a bit of a pattern to it. 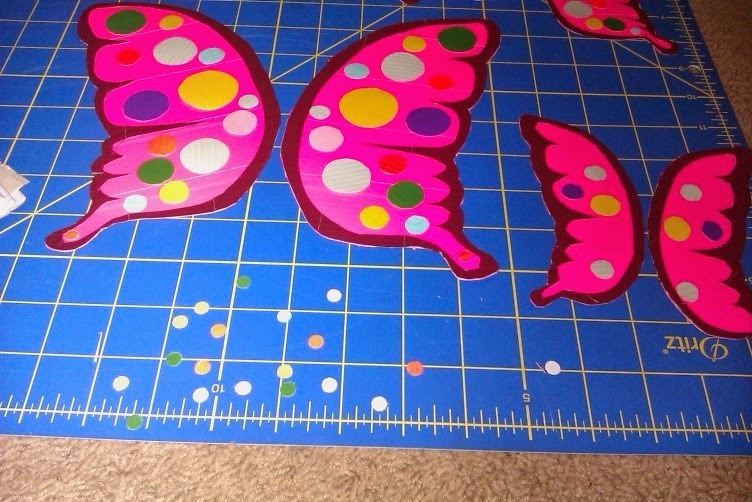 I wanted this pattern on my design so I cut out circles and squiggles (very technical terms, I know) from poster board and glued them onto the fabric so that when I duct taped it I would have the pattern. 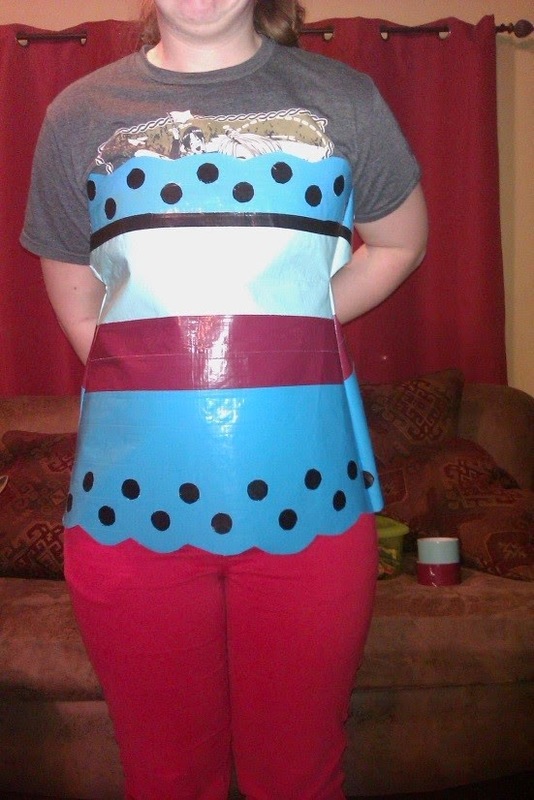 Again, I taped only the outside of the skirt and then I hemmed the bottom just like I did on the shirt sleeves/neck - I simple folded duct tape over to create a nice edge. For the top casing I simply folded the fabric over about an inch to create the casing for the draw string to tie the pieces around my waist. Having the pieces stay separate helped get them on and off easily. Again, the top of the skirt would be under the corset so I wasn't too concerned with the fact that I would have strings showing. 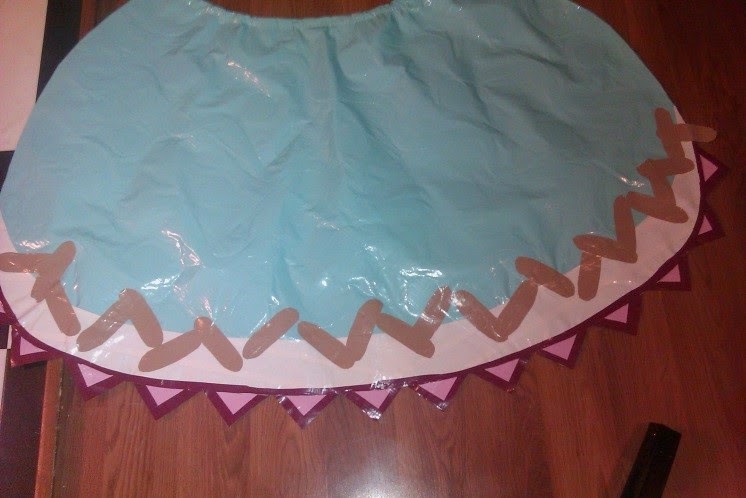 The next step was to create about a billion triangles to attach to the bottom of the skirt pieces. 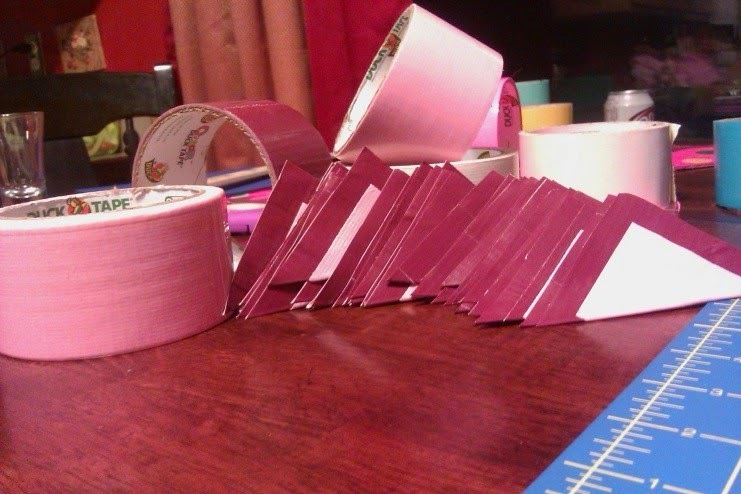 I attached them by simply stapling them on and then taping the bottom design on top of the staples to cover them up. Make sure it has an extra tab on it for stapling. While I thought the wings would be the easier part of my cosplay it turned out to be one of the harder parts and I ran into many problems while creating the wings. 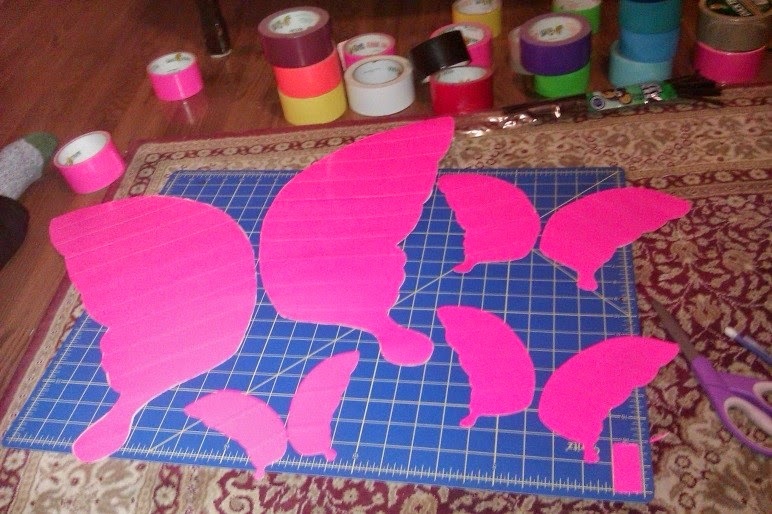 I started by cutting out the shape of the wings from pink poster paper which I then covered in pink duct tape. 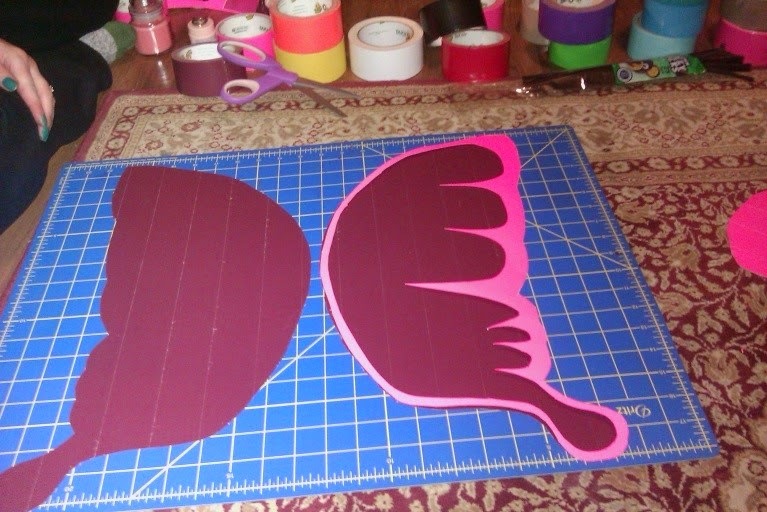 I then used the same shape to create a stencil to make the maroon edge you see on the wings. After that I did the best I could to make the dots on the wings the same size and color as they are on the characters wings. 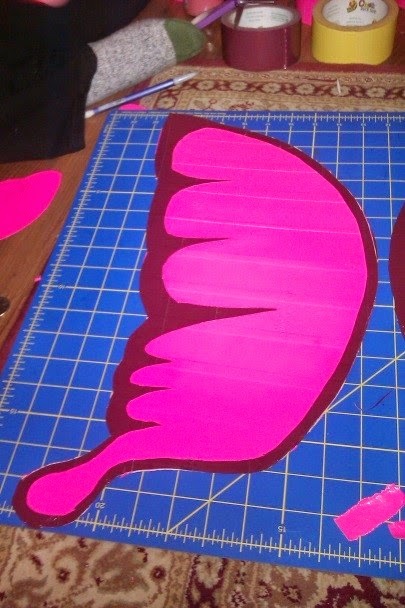 I repeated this process for each of the four sets of butterfly wings in my cosplay. That was the easy part. 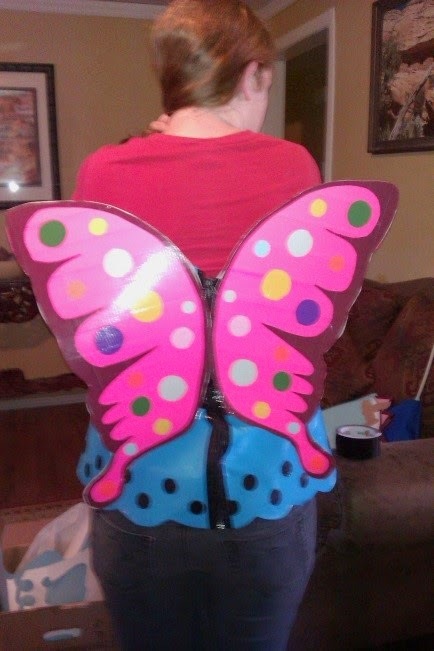 I had to figure out how to attach the wings on my back and make them stay up. After many trials and errors the wings were put on with staples, glue, duct tape and wire. While it looked good for the first couple of pictures the wings were definitely starting to droop by the end of a day of wearing this cosplay. 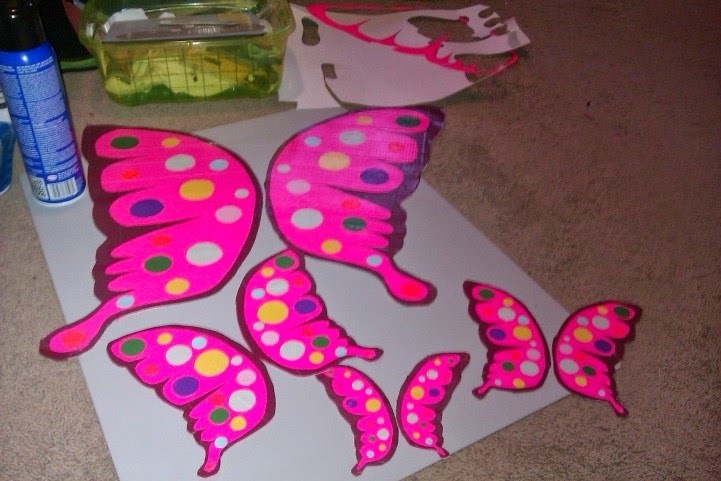 I hope to improve the wings one day, but for now they are still a work in progress! The corset, while not quite as daunting as the wings, still presented many difficulties. 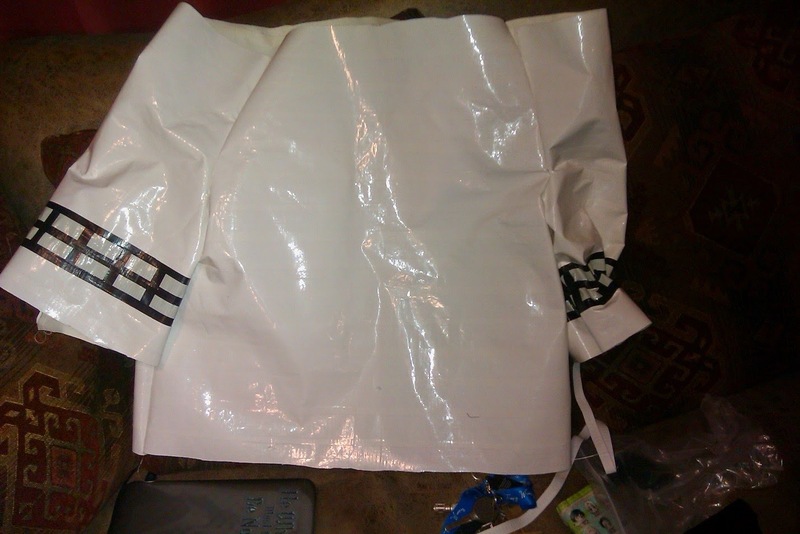 This was the one part of the cosplay that was supposed to be mostly fitted. But duct tape isn't something you can easily fit to your body and still be able to move in. After many drafts and experimentation I was able to make a semi-fitting corset that allowed room for movement but also gave a somewhat fitted look. Just like the shirt I cut out the pattern from fabric, then duct taped the pattern on before sewing the sides together. It is hooked together with a zipper in the back. 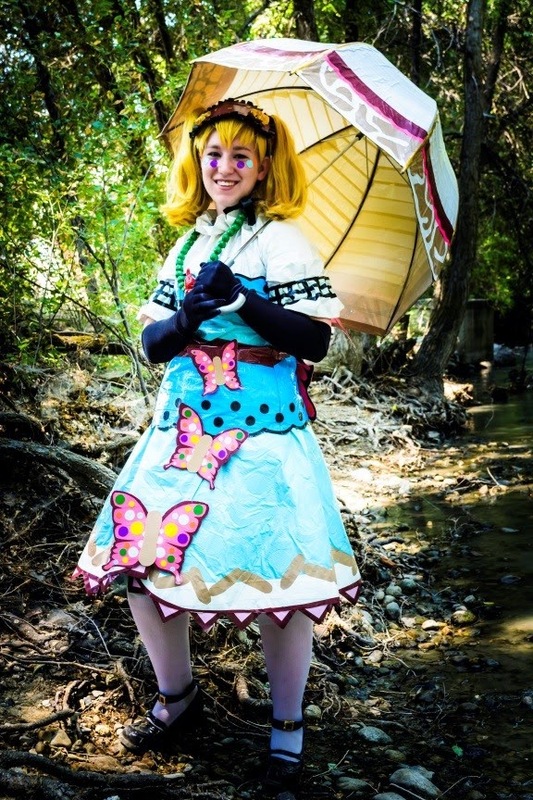 My cosplay has a lot of random accessories that were overall very fun and easy to create. 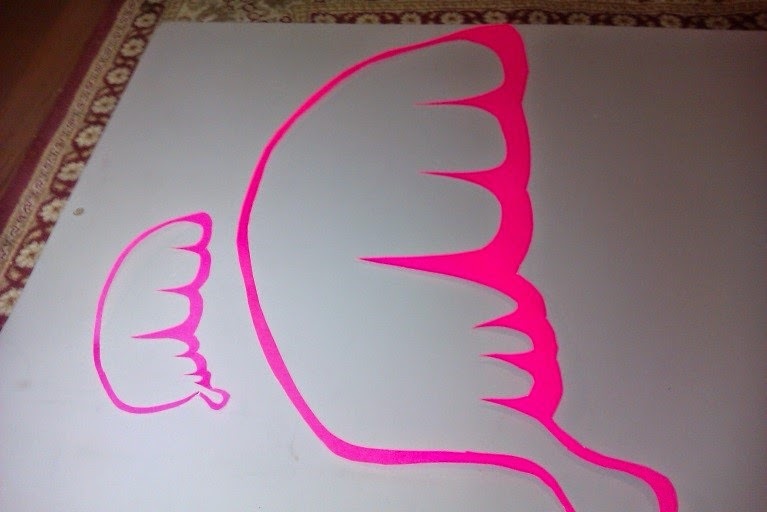 I started by cutting out the shape from poster paper then created the ruffle around the edge by getting a really long strip of black duct tape and simply stapling it on in a ruffled pattern around the whole edge. 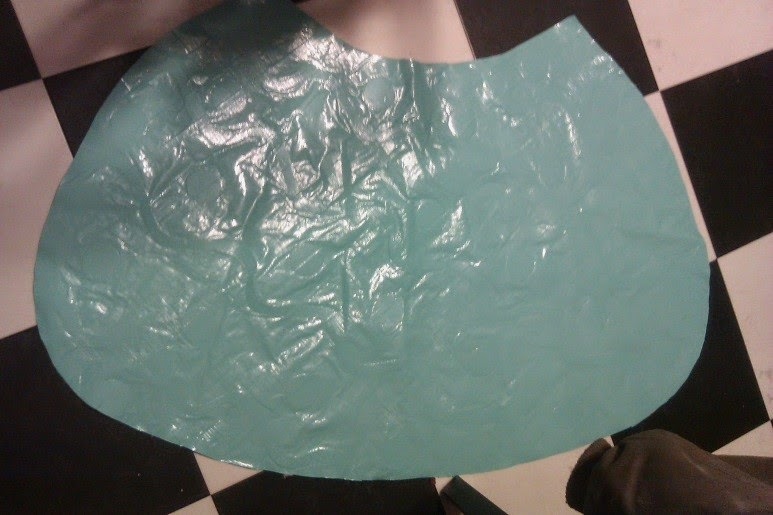 Then I duct taped the top of the poster paper, which covered the staples and the inside edge of the ruffles. Then I got tacks, covered the heads in duct tape and stuck them through the headpiece. 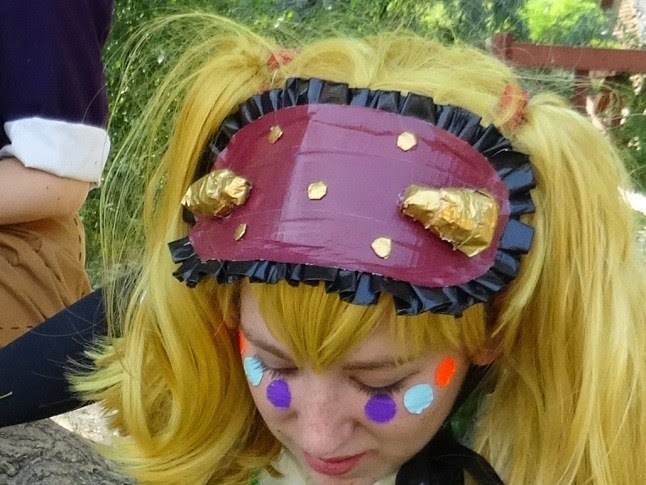 I folded the bottoms over so they wouldn't stab my head and then added an extra layer of duct tape on the bottom of the headpiece to cover up the bottom of the tacks. These were pretty simple to make. I bought wooden beads and covered them in small strips of duct tape so that they had the look of some sort of bug. 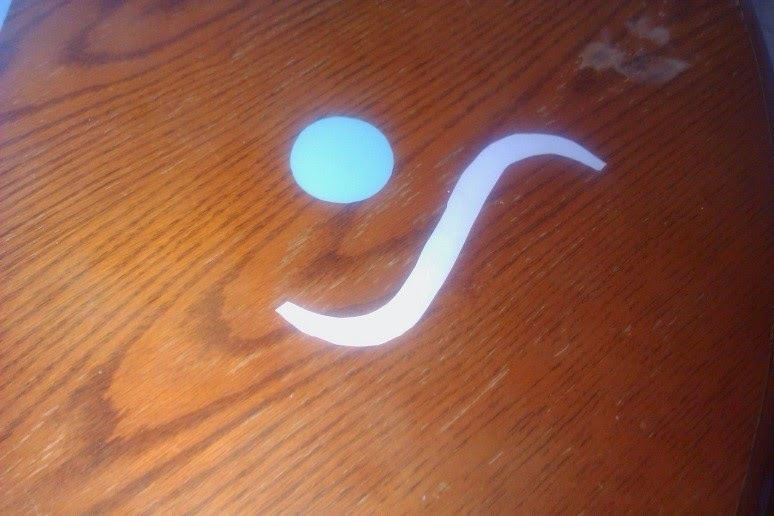 The strips also made is so I could cover it more easily because you can’t really stretch a piece of duct tape over a circular bead and make it look good. I got a pair of clip on earrings since my ears aren't actually pierced and covered them in duct tape that I cut into the shape of a beetle. 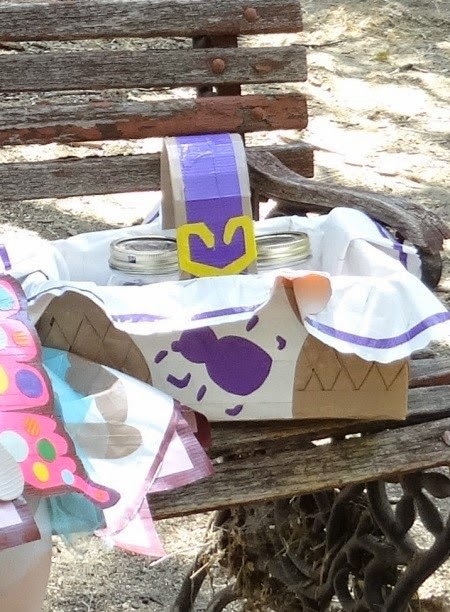 I made a bunch of strips of duct tape and wove them together over a shoe box. The hard part of this was making the handle durable. Had I been smart I would have attached the handle before making the base of the basket, but I didn't think that far ahead so the handle was attached after and therefore wasn't very sturdy so I couldn't actually use the basket very much, but it looked great in pictures the design on the side of the basket was cut out using a stencil and an exact-o knife. This was my favorite accessory to make! I bought an umbrella and started by covering it in white duct tape. 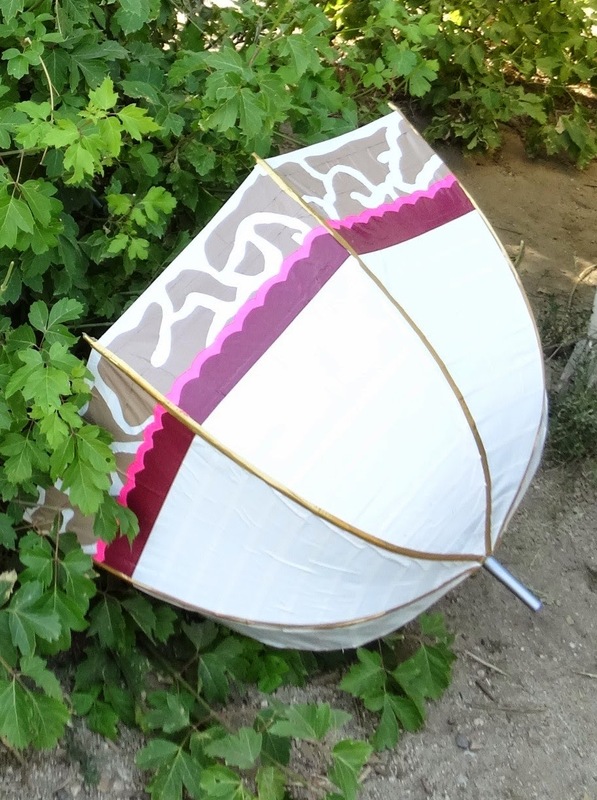 I then cut out the design (trying to match the one on the original character design) using an exact-o knife and carefully placing it on the bottom of the umbrella to create the cool trim. The umbrella is fully functioning. It can be opened and closed. You can find Duct Tape Nerd Life on Facebook. You can also read her original interview on this page.